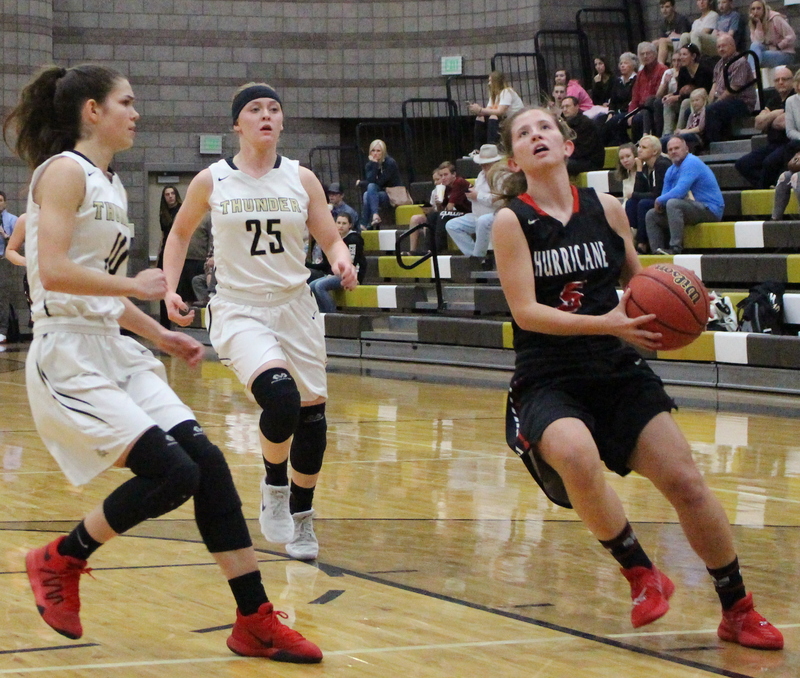 ST. GEORGE — Hurricane High’s Jayden Langford scored all 19 of her points in the second half to lead the Lady Tigers to a 47-37 win at Desert Hills. It was an evenly played first half as both teams showed patience on offense, working the ball around the perimeter and looking for ways to penetrate each other’s solid defense. Hurricane’s Madi Hirschi opened the scoring with a 3-pointer after the Tigers got a steal on Desert Hill’s first possession. The Thunder’s Annie Frame hit a jumper and a layup to give her team an early 4-2 lead. 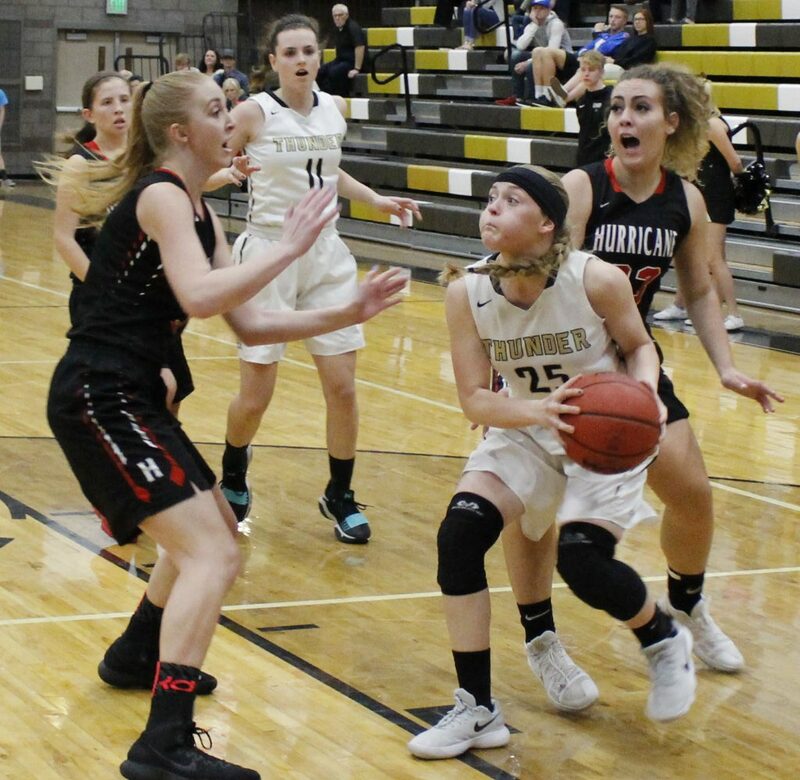 Madison Clark added a 3-pointer after Desert Hills ran its offense for more than a minute before Clark got an open look from the top of the key. Frame led the Thunder with 11 points, while Clark had 9. Hurricane closed out the first quarter on a 6-0 run to take a 9-7 lead into the second. The Tigers extended the lead when Hirschi opened the quarter with her second 3-pointer. She would add another in the fourth quarter and finish the game with 11 points. However, Hurricane would score just one more basket over the final 7:25 of the second quarter as Desert Hills outscored the visitors 9-2. The run was fueled by Frame’s 5 points, including the final three of the quarter when she scored on a drive to the rim, was fouled and made the free throw. It gave the Thunder a 16-14 lead going into the locker room. Hurricane coach Franci Homer said her team made some adjustments at halftime. “Our defense in the second half was a lot better than our defense in the first half,” she said. “We talked about what we were going to change if we went to a man and what we were going to change if we were in a zone. The Tigers set the tone on the first possession of the second half, forcing a turnover and tying the score when Langford got free down low. She then got a steal and pushed the ball up court for another score. After Hailey Homer scored inside, the Tigers forced another Thunder turnover. Langford grabbed a teammate’s air ball and put it in for a 22-16 lead. The teams were even for the rest of the third quarter and Hurricane took a 29-23 lead into the fourth. 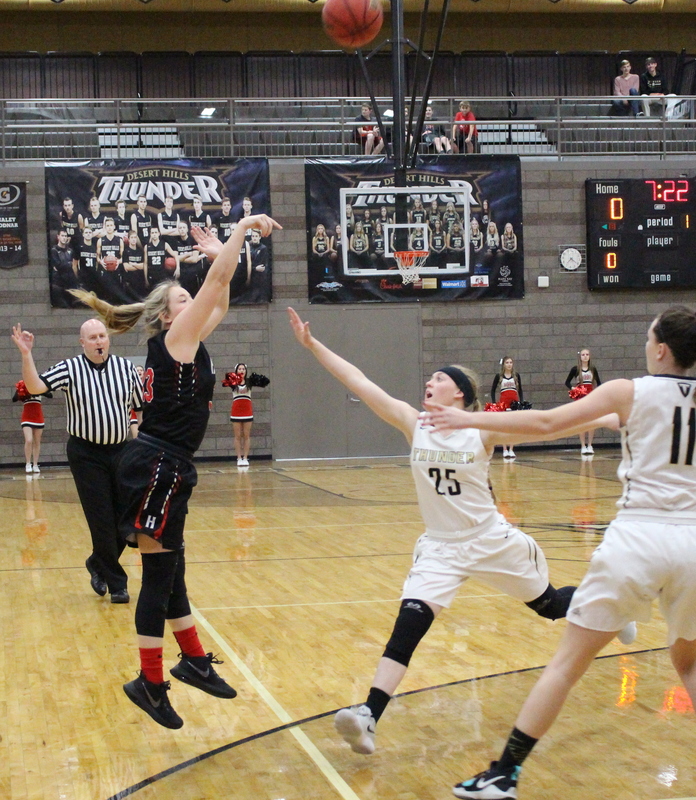 Clark got Desert Hills started with an offensive rebound and a one-hander from just inside the lane, but Langford countered with an aggressive and difficult drive to the rim, somehow getting off a shot in the middle of three defenders. The shot was good, she was fouled and converted the free throw. Clark answered with a pull-up jumper off a hard drive into the defense. The Thunder’s Jess Mathis drained a 3-pointer from the top of the key. Hurricane’s Kylee Stevens missed her shot from downtown, but the Tigers got the offensive rebound and fed Stevens who hit a jumper from just behind the free-throw line. However, the Thunder’s Kami Bliss sank a 3-pointer to pull her team to within a point at 34-33. Desert Hills seemed to be gaining momentum, especially when Clark stole the ball on the Tigers’ subsequent possession, but Langford in turn picked Clark’s pocket, pushed the ball up court and made the layup. The Thunder went from having a shot at the lead to trailing by three with 3:08 left in the game. Coming out of a Desert Hills time out, the Tigers fouled Bliss, who hit both free throws to pull the Thunder to within 36-35. However, Hirschi came up big, hitting what turned out to be the key shot of the game, a 3-pointer with 2:37 left. The Tigers made all eight of their free-throw attempts down the stretch – including six by Langford – to keep Desert Hills at bay. The win improves Hurricane’s record in Region 9 to 7-3 and solidifies its hold on second place, a game behind Cedar High (8-2), which defeated Pine View Thursday night. Cedar travels to Hurricane on Feb. 13 with first place on the line. The Tigers defeated the Lady Reds earlier this season when Langford hit a shot at the buzzer. Despite the loss, Desert Hills (5-5) is in good position for a berth in the 4A state championship tournament. The Thunder trails third-place Pine View by a half game and leads fifth-place Snow Canyon by a half game. The Warriors lost to Dixie on Thursday. Desert Hills plays the Flyers on Feb. 13. The top four teams in the region qualify for the 4A state championship tournament, with the top two earning home games in the first round against Region 12’s third- and fourth-place teams. Likewise, Region 9’s third- and fourth-place teams travel to Region 12, which is in the Logan area, to play its top two teams. First-round games will be played Feb. 23. The remainder of the tournament will be played March 1-3 at Utah Valley University.